New York: Tom Doherty Associates, 2011. My husband observed, not long ago, that the reading material I have been choosing to read aloud with the eldest two boys has been largely fantasy (boy magicians, hobbits, mythological creatures, both ancient and contemporary). I was really taken aback because I had not made those choices deliberately or out of a preference from my own childhood reading. I would never have called myself a fan of fantasy. I did not read fantasy much at all as a child, but in my second childhood it seems to be what my boys and I are gravitating towards. Perhaps it’s a gendered thing. 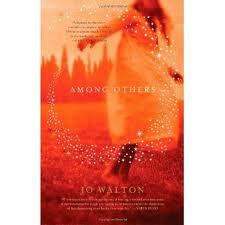 As Mor, the tweenaged protagonist of Jo Walton’s Among Others, notes, the only other girl her age at her science fiction book club was introduced to sci fi by her boyfriend, and most of the people are male. Most, but not all. And that’s it. It’s a passing reference to the demographics of the group, and gender will come up again in her observations about who leads the weekly discussions, but for Mor, science fiction is a way to bring her into a community, not to divide her from one. Mor’s story is written as a journal, and begins very much in medias res, with Mor trying (not very successfully) to settle in at a boarding school where she’s been sent by her father’s family, after having run away from her (unfit) mother and been put in an orphanage. In the space of a few pages, she meets her father for the first time and then meets his extensive library, which contains many fantasy and sci fi titles and authors she has already come to love. A bookworm of the first order, and, again, in a very short span of time, she discovers, to her great delight and to her social salvation, that there is such a thing as book clubs and makes friends and meets a beautiful boy at her book club. A boy so beautiful, she is afraid she has conjured him by magic. Magic is the fantasy element of this novel, and it is so deftly handled that you could read Mor’s engagement with magic either as genre fantasy or as a psychological puzzle. In fact, she invites you to question her over and over (and over and over) again. Plausible deniability is a catchphrase, and she comes back again and again to the loopholes in magic that make it possible to, well, wave a wand, and make all things magical appear perfectly normal. She sees fairies, and so does her twin, but her twin is dead so there’s no one to corroborate her story. She casts protective spells and makes other kinds of magic that may or may not have enormous repercussions. Having just read and very much enjoyed Eowyn Ivey’s The Snow Child, which is a contemporary retelling of a Russian fairy tale that keeps a graceful balance between fairy tale and realism, I felt perfectly at home in the liminal space of this book. I neither wanted to believe nor disbelieve Mor. I just wanted more and more and more of her story, which makes me a victim to its magic after all, I guess. If ever there was a book designed to bring me out of books-about-books blogging hibernation, this is it. I don’t know when I’ve ever read a novel with so many loving references to other books in it. It was delightful. And I haven’t even read most of the books she refers to. I imagine that the pleasure factor is exponentially higher if you can relish with her the discovery and love of books you have also loved. Fantasy may not have been what I pulled off the shelves as a child, but it connects me so blissfully to my boys now. I don’t feel like an imposter in the world of fantasy that they love any more than Mor feels like an imposter in her book club (she has plenty of other places from which to feel excluded and plenty of other reasons to feel like an impostor). What comes through so clearly is this girl’s immersion in a body of literature that has kept life and limb together for her. And who could fail to love a narrator who so clearly lives for (and in) books? That the book also feaures three very lovable librarians is icing on the cake. Jenny, at Jenny’ Books, was the first whose recommendation I came across, then Kerry, at Pickle Me This, also recommended it. Now, when Kerry or Jenny rave about a book, I generally go out and get it. When they both rave, I know it’s A Sure Thing. It is. Sounds wonderful, Nathalie, thanks for this. Yay! So glad this made you happy. I’ve been recommending it all over. Glad you liked it! Nice use of “liminal” btw, I love that word and it doesn’t get used enough, although Among Others is a very good book for bringing it forth. I loved the way the story hovered on the edge of real life and fantasy.